This page describes some of the most common ways to connect to your Compute Engine Linux instances and Compute Engine Windows instances. Connecting using third-party tools, including PuTTy. Before you connect, you must set up user access to your instance. This page assumes you've followed the Quickstart using a Linux VM guide or the Quickstart using a Windows VM guide to create your instance, which includes creating default user access. Complete at least one of those guides before continuing. To learn more about managing user access to your instance, see Managing Instance Access. If these basic SSH options do not work for you, you might need to connect to instances using third-party tools or connect to instances that have no external IP addresses. Use the gcloud compute ssh command to connect to instances that you have permission to access. After you connect, use the terminal to run commands on your Linux instance. When you are done, use the exit command to disconnect from the instance. By default, Compute Engine adds the generated key to project or instance metadata. If your account is configured to use OS Login, Compute Engine stores the generated key with your user account. It is not necessary to know where your SSH keys are stored if you're connecting in the ways described in this document, but you might need this if want to connect using the alternative or advanced methods of connecting described in Connecting to Instances Using Advanced Methods. install the Chrome RDP for Google Cloud Platform extension. Go to the VM instances page in GCP Console and find the Windows instance you want to connect to. Click the RDP button for the instance you want to connect to. The Chrome RDP extension opens. Enter the domain, your username, and password, then click OK to connect. If your instance does not have a domain configured, you may leave the Domain field blank. If prompted, press Continue to accept the certificate. Identify the external IP address of your Windows instance from the VM instances page. 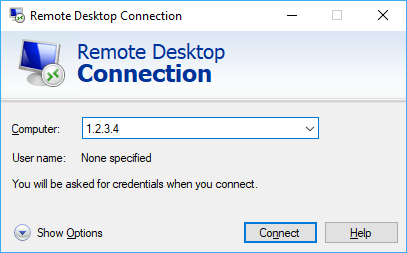 Open Microsoft Windows Remote Desktop Connection on your Windows machine. Enter the external IP address into the Computer field. Click Connect. Note: If you've configured your instance to use a different port number for RDP, add it after the IP address. For example: 1.2.3.4:3389. Enter your username and password. Then click OK to connect. Install the supported client according to the client's installation instructions. Connect using the external IP address of your instance, and authenticate with your username and password for the instance. For a list of officially supported clients, see Microsoft's Remote Desktop Clients article. If you have difficulties connecting using RDP, see the Troubleshooting RDP page. This section describes how to connect to your Windows instance using an interactive serial console, or the Windows Special Administrative Console (SAC), which is often used for advanced troubleshooting on Windows instances. For more on using the interactive serial console, see Interacting with the serial console. Open the VM instances page in GCP Console and click on the name of your instance. The VM instance details page opens. Click Edit. Under *Remote access, select Enable connecting to serial ports. This enables the interactive serial console for this instance. Alternatively, if you want these settings to apply to all instances in your project, set project-wide custom metadata instead. Caution: The interactive serial console does not support IP-based access restrictions such as IP based allow-lists or block-lists. If you enable the interactive serial console on an instance, anyone from any IP address will be able to connect if they know the SSH key, username, project ID, zone, and instance name. Click Save, then return to the top of the page. Under Remote access, click the dropdown next to Connect to serial console, and select Serial port 2. A Windows Special Administrative Console (SAC) opens. At the SAC> prompt, run cmd to create a new channel. SAC returns the channel name, such as Cmd001. Press any key to confirm connection to the channel. 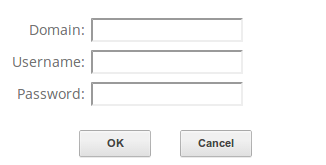 Enter the username, domain, and password of the instance to connect. Note: If the instance does not have a domain configured, don't input anything at the domain prompt; just press enter to continue. If you haven't done so already, download and install the Google Cloud SDK for your local operating system. See Installing Google Cloud SDK. Run the following command to configure your instance to allow for connecting to serial ports. Note: You can also configure your instance's metadata by clicking the Edit button for your instance on the VM instance page. Learn how to connect to instances using third-party tools. Learn how to connect to instances that have no external IP addresses. Learn how to manage instance access manually by adding and removing SSH keys in metadata, which is an alternative to granting access through IAM roles. Learn how to transfer files to instances.